I have been into finding my favorite scents, and thought I would share my current favorites with you. 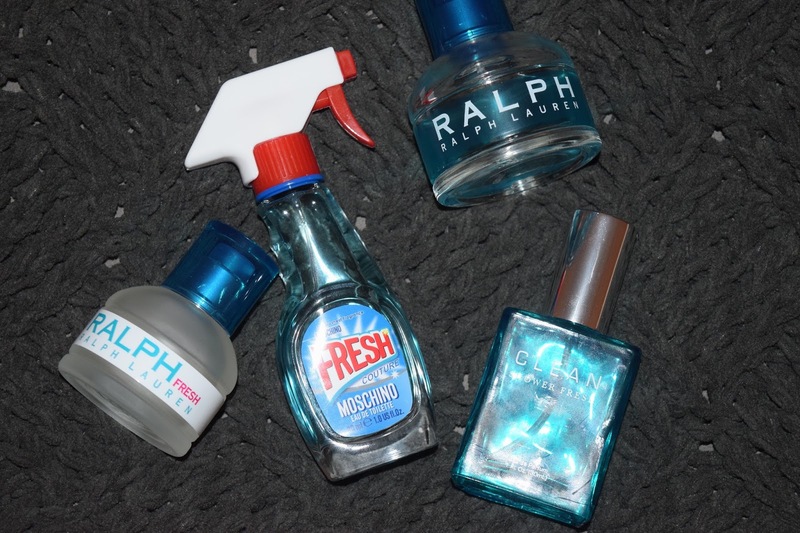 I have found four fragrances I am in love with and hopefully you will love too! Leave me your favorites in the comments and I'll be sure to give them a try! Ralph Lauren Fresh- I love this for any summer day. It smells so fresh and clean and I feel put together when wearing this! Ralph Ralph Lauren- I love this scent for days when I want to smell clean. I love how fruity and citric it smells. Notes: Apple Tree Leaves, Yellow Freesia, Italian Mandarin, Japanese Loquat, Osmanthus, Magnolia, Linden Blossom Flower, Purple Freesia, Boronia, Musk 2000, White Orris. Clean Shower Fresh- I love this scent for right after I get out of the shower. It reminds me of a clean man smell (in a feminine way) and prolongs my clean, just showered feeling! Notes: Lemon, Mandarin, Orange, Jasmine, Lily of the Valley (Muguet), Orange Blossom, Sheer Woods, Musk. Moschino Fresh Couture- This has recently become my new favorite scent. I just tried it out and am obsessed. I also think the packaging is super cute and funny! I just realized that all the bottles are blue! So random lol. As always, thank you so much for watching, and leave any suggestions in the comments below!